THE JP McManus-backed International Rugby Experience in Limerick is set to be even bigger after it emerged Fine’s Jewellers will make way for the development. Up until now, the museum, which has a €10m backing from Mr McManus, would have been built around the city centre jeweller. But in what is likely to prove the end of an era, planning documents have this week confirmed that a deal has been reached for the purchase of Fine’s Jewellers, and its inclusion as part of the International Rugby Experience, chaired by Munster legend Paul O’Connell, and now likely to deliver in excess of the 100 planned roles. Rugby World Experience has submitted a new planning application to Limerick City and County Council which will see an extension of the rugby experience to include Fine’s Jewellers premises and basement. It’s unclear whether the jeweller will open away from the ‘Lucky Ring corner’ the family has made their own. Company owner David Fine was not available for comment. City businesswoman Helen O’Donnell wished the Fine family the best of luck. “It means that the rugby museum won’t be built around someone else’s businesses, as was the original plan, so I’m delighted for them in that sense. It makes sense for them as a family, so I’d say the very best of luck with them,” she said. An Bord Pleanala have already cleared the way for the majority of the museum development to go ahead, and it’s understood the new application which is before Limerick Council will not cause any major delay on the project. The multi-million euro proposals will see the demolition of numbers 40 and 41 O’Connell Street as well as the knocking of the first three floors at the neighbouring building. Number one Cecil Street will also be demolished to make way for the development. 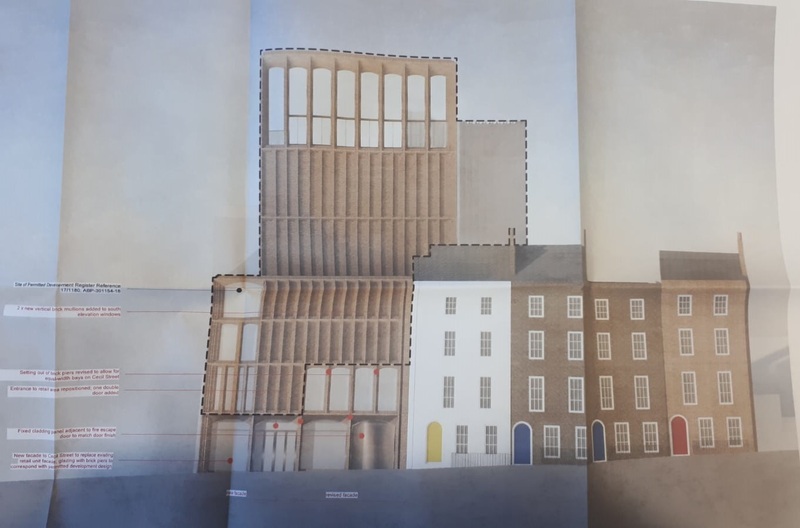 In there place, there will be a seven-storey building with a two-storey portico fronting O’Connell Street and a two-storey block to the rear. Inside, the development will see a “multi-media visitor experience, exhibition and education space” plus retail and cafe at ground floor levels. Overall, it represents a €30m investment that will bring tens of thousands of visitors to Limerick, it is understood. One hundred jobs are set to be created, but it is understood if plans to move into Fine’s are green-lit, this will grow substantially. There would be an extended retail area of 88 square metres overall, which is intended to offer rugby-related merchandise, while extra features will also be accommodated to augment the visitor experience. The objective of the development is to celebrate the sport of rugby throughout the world with futuristic and interactive presentations. The attraction has been designed by internationally renowned architect Niall McLaughlin. The International Rugby Experience declined to comment on the latest planning application when contacted by the Limerick Leader. Limerick City and County Council is set to make a decision on the plan by March 7 next.